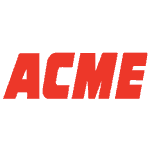 Acme Markets Inc is subsidiary of Super Value incorporation. This supermarket chain mostly operates in Delaware Valley. Headquarters of the organization is in Warminster, PA and the company started its journey in the year 1891. Two Irish immigrants- Samuel Robertson and Robert Crawford started this organization. At present, the company is operating total 117 super markets in different US states like Maryland, Delaware, New Jersey and Pennsylvania. According to 2011 record, the company is 2nd largest food retailer in Philadelphia. Keith Wyche and Craig Herkert are respected president and CEO of the organization. Seafood, liquors, snacks are some of the items delivered by this supermarket chain.